The rates may vary between weekdays and weekend ( Friday & Saturday ). PLEASE REFER TO OUR "BOOK NOW" SITE TO SEE THE EXACT RATES. Seraglio Hotel&Suites reserves the right to change these rates at any time without prior notice. 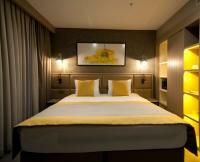 THE RATES ARE EURO BASIS AND INCLUDE ROOM,OPEN BUFFET BREAKFAST AND VAT. THE RATES INCLUDE ALL KIND OF TAXES. WI-FI IS AVAILABLE IN ALL AREAS AND FREE OF CHARGE. COMPLIMENTARY TEA TIME IS SERVED BETWEEN 17:00-19:00 EVERYDAY. COMPLIMENTARY TEA&COFFEE FACILITIES WITH A KETTLE IN ALL ROOM TYPES. 1.5 LITERS SPRING WATER IS PROVIDED EVERYDAY IN ROOMS AS COMPLIMENTARY. **ALL OF THE ABOVE OFFERS ARE NOT VALID FOR 3RD PARTY WEBSITE RESERVATIONS/COMPANIES. ***WE DO NOT OFFER ANY OF THE ABOVE OFFERS FOR 3RD PARTY WEBSITES/COMPANIES. 7 % CASH PAYMENT DISCOUNT IF THE ROOM TOTAL IS PAID IN CASH AT THE CHECK-IN TIME. *SOFA BED IS SUITABLE FOR UNDER 12 YEARS OLD AND AVAILABLE IF REQUESTED ON ONLINE BOOKING. This room is located on our annex building on the same street with the main building (15 meter to reception entrance) which is a historical wooden town house. Therefore there is no lift access to the floors. Family room is one floor down from the entrance of the building, on the garden level and gets full daylight but no view. This room has a private mini courtyard (4square meter) surrounded by garden wall. From your room you can contact the reception 7/24 directly by just dialing "0". two rooms & one bathroom This room is at the SERAGLIO SUITES building.Our suites has a private entrance which is across the street from the Seraglio Hotel(just 10-15 meters). two rooms + two bathrooms.This room is at the SERAGLIO SUITES building.Our suites has a private entrance which is across the street from the Seraglio Hotel(just 10-15 meters).